You know, the problem with most modern castles is that they're so... intact. They're a classic fixer-downer situation. Not only do you have to buy the castle, but you have to spend all that time and effort and money turning it into a proper castle ruin. Historic Helderberg Castle on 4.5 acre lot, chance to own a unique piece of history. Nestled privately in the Helderbergs, this property features fantastic old limestone ruins, hand built in 1935 by Bouck White. 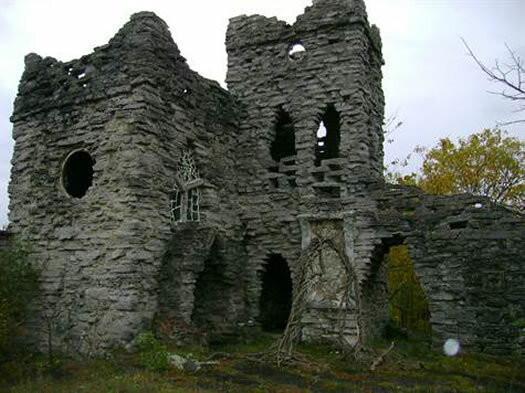 Property has church ruins, tower ruins,main home ruins - with 2500sf home situated atop stone ruins of 2 other buildings. Property also has 1500sf 2 car garage w/ workshop w/ electric and woodstove. Home has lrg bedrooms, porch, stone alcove, deed spring rights with neighboring property. See, it's a ruin-ready castle. Here's a photoset, and satellite view of the property. List price is $179,000. [B]y 1932, he was back in New York and running a pottery studio in an Albany carriage house. In 1934, White bought six acres in the Helderberg Mountains. He was attracted to the lonely cliff by a belief that it was where Hiawatha supposedly experienced visions that lead to the founding of the Iroquois Confederacy. White had long claimed Mohawk ancestery, saying, "I don't know how much of the blood of Hiawatha is in my veins, but my heart is Indian." "The stones are not hacked or broken to form a window opening of some perceived pattern; they are allowed....to build a window of any form whatsover...A new resource for the architect is here emerging, provided their clients be animated by a spirit of natural beauty." A few weeks ago, YNN's Geoff Redick had a story about the castle being for sale, which includes some more bits about its history. As the listing agent said then: "There's not one thing that's, uh...normal about this house. I don't even know how to put that, I really don't!" Such a nifty property, honestly. Like the realtor said, this is an unusual home. It's going to have to be a cash deal for sure, because how on earth would any appraiser be able to "comp it out"? Well one can never have enough ruins in their life! It truly is a one of a kind property and will require a just as unique buyer. Interesting that Bouck White placed Hiawatha's vision on the Hedlerberg escarpment. Most people place it at Cohoes Falls. It would be great is somebody bought this and turned these evocative ruins into a space open to the public on even a limited basis -- meditation center, outdoor theater.